An invitation in the style of old parchments, decorated with an embossed pattern and gold foil at the edges. Paper with a delicate, regular texture with a flower and leaf print. 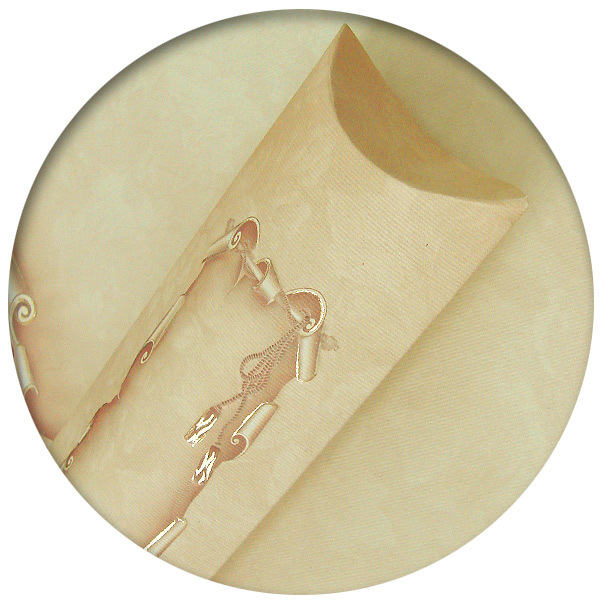 The whole is coloured in beige and light brown. The invitation comes with a matching box at no extra charge. Prices include UK postage and envelopes (as shown on image). If you require a larger quantity then contact us for a quote. 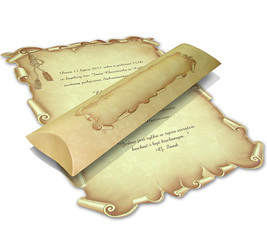 To order this wedding invitation select required quantity and click add to cart button. Then proceed to checkout. Once these steps are completed, fill in and submit this Invitation Wording Submission Form. We will arrange it on the invitation for you so you do not have to worry about it. 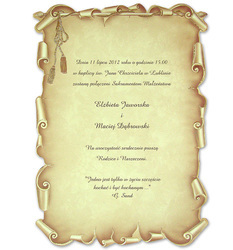 Then we will send you a visualization of how the invitation will look like with your wording. You can either make comments (which we will incorporate and re-send invitations for re-checking) or approve the invitation - it will then be sent to a printer. For detailed instructions and our full terms and conditions go to How to Order section. For UK delivery it takes up to around 10 days from when you sent us your approval for print, to when the invitations are delivered. Please contact us for international orders and we will adjust postage fee and give you delivery date estimates. It is always possible to cancel a purchase before you sent us your approval for print. In these cases money will be refunded in full. Once we receive your approval for print, no refund is possible. Because wedding invitations are personalized with your invitation wording, we do not accept any returns.